By age sixteen, I was living communally and happily in the Fort Greene neighborhood of Brooklyn, having adventures right and left (well…mostly left). This was 1969, 1970. I think of those days---staying up late with my friends and housemates, drinking herb tea, having impassioned political discussions, reading with a pen in hand so I could underline and fiercely scribble marginalia- as being the equivalent of my college years, since I never did go to college. One of my favorite things to do, then, was to take the subway a couple of stops to the Middle Eastern section of Brooklyn Heights. I felt perfectly at home in the sense of being comfortable and safe. Yet, the fact that I felt not at home (being immersed in another culture) was part of the experience. Lining Atlantic Avenue were small, inexpensive, family-owned restaurants, the kind where a couple of generations of relatives would sit at a back table snapping the stems off gigantic bowls of green beans, speaking Arabic. Eating there, I felt adventurous and worldly, though I had not then actually traveled beyond U.S. borders. And I loved the food, which was then very exotic: Syrian and Lebanese versions of hummus, stuffed grape leaves, meltingly tender lamb in various formulations. There were many Middle Eastern markets, too. The largest, most venerable was Sahadi’s, still very much in business, as it has been since 1948. I bought a cookbook there, and although it’s vanished from my library, I still make this lemony lentil-spinach soup, the great-grandchild of the one I learned it from. I think the original used much less spinach than I do, and over the years I’ve used many other greens instead of spinach; Swiss chard is particularly good. 1. Place the lentils in a large soup pot with 7 cups water and bring to a boil over high heat. Reduce to a simmer and cook, partially covered, until the lentils are tender but still retain their shape, 25 to 30 minutes. 10 minutes. Lower the heat slightly and add the spinach and garlic paste. Cook, stirring often, until the spinach wilts, about 5 minutes. 4. Add the onion mixture to the lentils, along with as much of the remaining olive oil as you like. Bring to a boil, then lower the heat to a simmer and cook for 5 minutes. 5. Just before you serve the soup, place the lemon juice in a bowl and whisk in the cornstarch until it dissolves. Add this slurry to the soup, stirring it until the soup thickens slightly but noticeably and gets a little glossy, 2 to 3 minutes. Don’t overcook it, or the cornstarch will unthicken. 6. 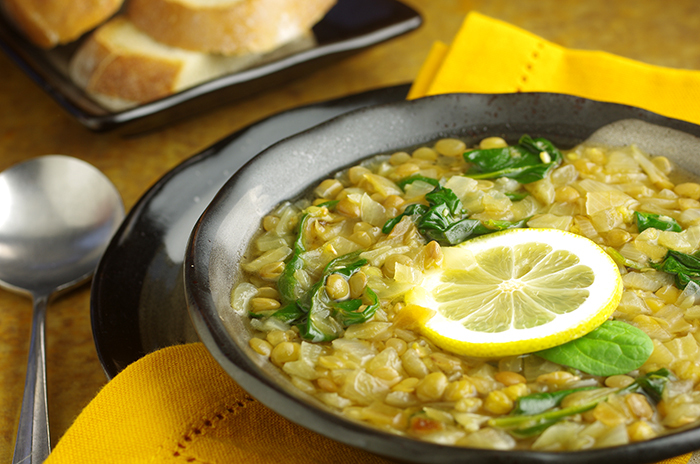 Serve immediately with a slice of lemon and a leaf of raw spinach floating on the top of each bowl. Recipes from Bean by Bean, a Cookbook by Crescent Dragonwagon. Published by Workman Publishing, New York, NY. Copyright 2011. Reprinted with permission of the publisher. All rights reserved.